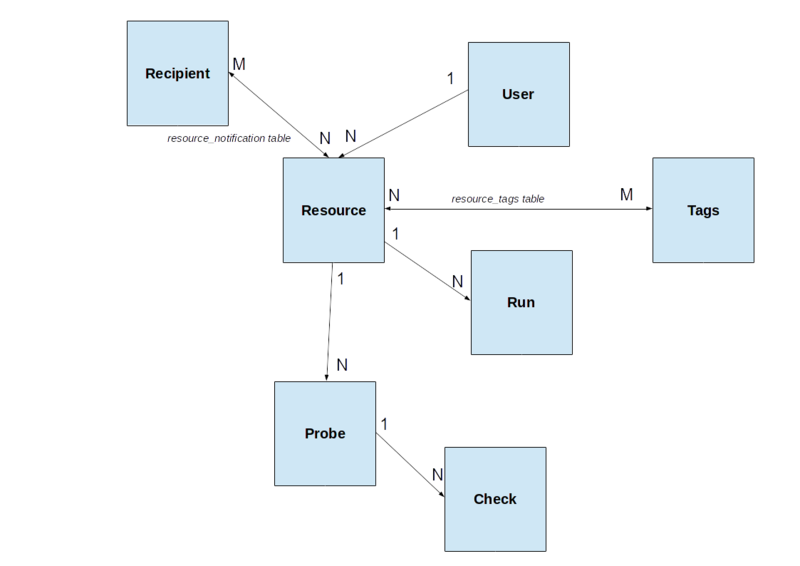 GeoHealthCheck (GHC) consists of three cooperating parts as depicted in the figure below. The GHC Webapp provides the Dashboard where users configure web services (Resources) for (scheduled) health-checks and view the status of these checks. The GHC Runner performs the actual health-checks and notifications, based on what the user configured via the GHC Webapp. The third part is the Database that stores all information like users, resources, checks, schedules, results etc. The GHC Webapp is run as a standard Python (Flask) webapp. The GHC Runner runs as a daemon process using an internal scheduler to invoke the actual healthchecks. GHC Webapp and GHC Runner can run as separate processes (preferred) or both within the GHC Webapp process. This depends on a configuration option. If GHC_RUNNER_IN_WEBAPP is set to True (the default) then the GHC Runner is started within the GHC Webapp. A third option is to only run the GHC Webapp and have the GHC Runner scheduled via cron . This was the (only) GHC option before v0.5.0 and will be phased out as starting with v0.5.0, per-Resource scheduling was introduced and cron support is highly platform-dependent (e.g. hard to use with Docker-based technologies). Dependent on the database-type (Postgres or SQLite) the Database is run within the above processes (SQLite) or as a separate process (Postgres). So in the most minimal setup, i.e. GHC Webapp and GHC Runner running within a single process and using SQLite as the database, only a single GHC process instance is required. Resource : a single, unique endpoint, like an OGC WMS, FTP URL, or plain old web link. A GeoHealthCheck deployment typically monitors numerous Resources . Deployment can be realized using the various standard Flask deployment methods: standalone, within a WSGI server etc. 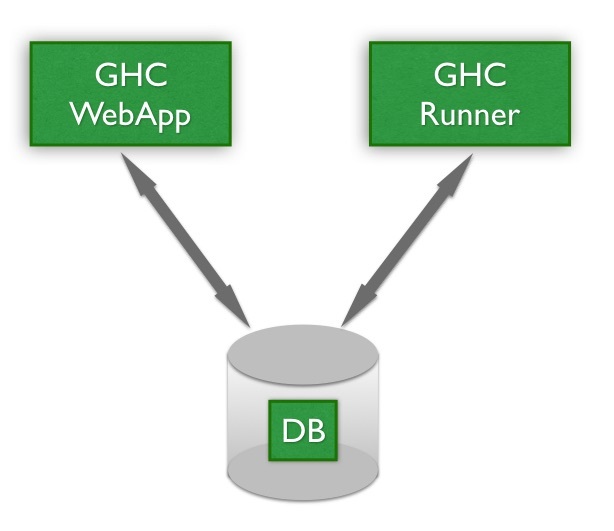 As an option (via configuration, see above) the GHC Runner may run within the GHC Webapp. Note that in case that when the GHC Webapp runs as multiple processes and/or threads “Resource Locking” (see below) will prevent inconsistencies. The GHC Runner in its core is a job scheduler based on the Python library APScheduler. Each job scheduled is a healthcheck runner for a single Resource that runs all the Probes for that Resource . The run-frequency follows the per-Resource run frequency (since v0.5.0). The GHC Runner is thus responsible for running the Probes for each Resource , storing the Results and doing notifications when needed. The GHC Runner can run as a separate (Python) process, or within the GHC WebApp (see above). Separate processes is the preferred mode of running. As multiple instances of the job scheduler (i.e. APScheduler) may run in different processes and even threads within processes, the database is used to synchronize and assure only one job will run for a single Resource . This is achieved by having one lock per Resource via the table ResourceLock . Only the process/thread that acquires its related ResourceLock record runs the job. As to avoid permanent “lockouts”, each ResourceLock has a lifetime, namely the timespan until the next Run as configured for/per Resource . This gives all job runners a chance to obtain a lock once “time’s up” for the ResourceLock . Additional lock-liveliness is realized by using a unique UUID per job runner. Once the lock is obtained, the UUID-field of the lock record is set and committed to the DB. If we then try to obtain the lock again (by reading from DB) but the UUID is different this means another job runner instance did the same but was just before us. The lock-lifetime (see above) guards that a particular UUID keeps the lock forever, e.g. on sudden application shutdown. To further increase liveliness, mainly to avoid all Jobs running at the same time when scheduled to run at the same frequency, each Job is started with a random time-offset on GHC Runner startup. The locking mechanism described above is supported for SQLite, but it is strongly advised to use PostgreSQL in production deployments, also for better robustness and performance in general.